The Government invested an additional funding of £150 million per annum in order to improve the provision of physical education and sport in primary schools. This funding is provided by the Department for Education, Health and Culture, Media and Sport. All schools with 17 or more primary-aged pupils received a lump sum of £8000 plus a premium of £5 per pupil. 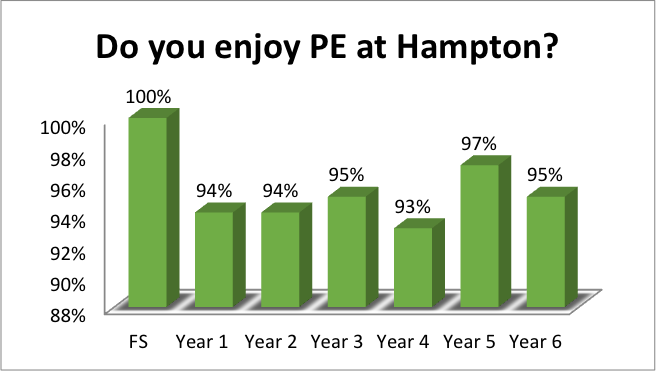 Hampton Primary School's Sports Premium allocation was £10,520 in 2016-17 and £21,450 in 2017-18. This funding is ring-fenced and therefore can only be spent on provision for PE and sport in schools. We are required to publish on-line information about how we have used the additional funding, including details about our sporting provision alongside curriculum details. This will ensure that parents and carers are made fully aware of the PE and sporting provision at Hampton Primary School. Sports Coach providing specialist sports delivery from FS – Year 6 through additional lunchtime sports provision 3 x week, After School Sports club 4 x week including Change 4 Life club, Holiday Sports club and Team Teaching for school staff. Sports Coach training to deliver and team teach enriched sporting activities – Climbing Wall, Fencing, Archery and 4 minute daily run. Intra-house tournaments termly for all year groups organised and run by Hampton Sports Crew. Baseline fitness assessments and progress measures. Membership of the HBH Schools Sport Network providing staff support, units of work and lesson plans. Swimming lessons subsidised for year 2, 3 and 6. Fire Fighter Fit Kids provision whole school. Trophies purchased for Sports Girl and Boy of the year to promote the importance of PE; these are awarded based on effort the children have shown, participation and collaboration. Outdoor activity lunch club provided for children. Subsidised Bikability for year 6 children. Online assessment package purchased within the HBH Sports Network. Sports Crew training to support children leading sporting activities. Improved performance/outcomes due to increased participation - Basketball team achieved 4th place in Kent. Years 1&2 team and Year 3&4 team achieved 1st place in the sports partnerships for athletics. The year 3&4 Gymnastic team represented Herne Bay in the Kent finals. The year 5&6 netball team came first place in the Coastal Alliance League. Happy Healthy Hampton Day – whole school event focused on the importance of a healthy and active lifestyle, athletes brokered in for the day to run workshops, motivating and inspiring the children. Purchase of further sports kit for children to wear at competitions, promoting team identity. Staff minibus driving training to enable participation in competitions and events off site. 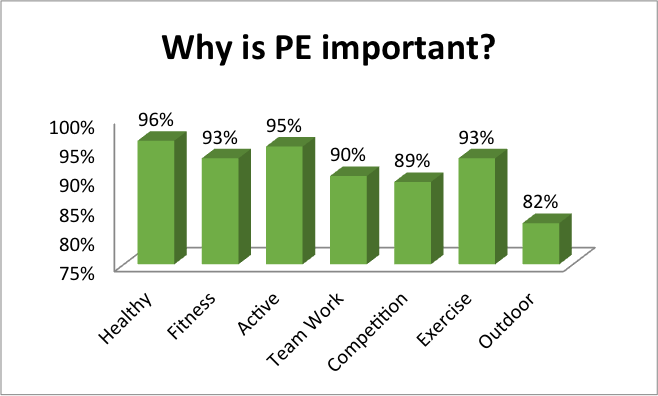 Purchase of surplus PE kit for children who persistently do not have/ or bring a PE kit to school to increase PE participation. 2017 – 2018 - 100% participation (unless for medical reasons). Below you will find the results from the Active Lives survey that year 1, 3 and 5 took part in last year. Please find attached the report of findings from the Active Lives Children and Young People Survey for pupils at your school. You are receiving this report because pupils at your school took part in the survey during the autumn or spring term of the academic year 2017-18. Thank you for taking part in the survey which was conducted on behalf of Sport England and provides them and their partners with important information about activity levels and other aspects of health and wellbeing among children and young people in England. The results shown are only for pupils at your school. We hope that you find the results informative. National level results were published on 6th December 2018. Owing to the small sample sizes in each school and the inclusion of a subset of year groups in the survey, care should be taken in comparing your results with the national figures or with other schools." Sports Coach providing specialist sports provision from FS – Year 6, through additional lunchtime sports provision 3 x week, After School Sports club 4 x week including Change 4 Life club, Holiday Sports club and Team Teaching for school staff. Membership of the HBH Schools Sport Network providing staff traing/support, units of work and lesson plans. Participation of inter school tournaments and events organised through HBH Sports network. Trophies purchased for Sports Girl and Boy of the year to promote the importance of PE; awared for effort and participation. Assessment package purchased which is inline with other schools in the HBH Sports Network. Happy Healthy Hampton Day – Whole school off curriculum day learning about the importance of a healthy and active lifestyle and successful athletes on site to inspire children. Race for life – Whole school event; race for life to raise money and raising awareness of leading an active lifestyle. Guiness World Record attempt – ‘The World’s Largest Basketball Lesson’. Participation in the Inspire Carnival. Purchase of sports kit for the children to wear at competitions to promote team identity. Costs to train key adults to drive the minibuses to aid participation in competitions and events.